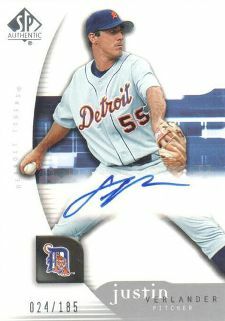 As one of baseball's most dominant pitchers, Justin Verlander cards and memorabilia are among the most popular among the most popular in the hobby. His rise to the majors can be defined as All-American. A top pitching prospect in high-school, he eventually went on to play collegiate ball at Old Dominion University. Verlander's over-powering pitching helped lead Team USA to a silver medal at the 2003 Pan Am Games. Catching the eye of numerous scouts, he was taken by the Detroit Tigers as the second overall pick in the 2004 MLB Draft. His quick rise through the minors was due, in no small part, to his ability to locate his 100+ mph fastball for strikes. Verlander went on to become the American League's Rookie of the Year in 2006 and helped lead the Tigers to a World Series match-up against the St. Louis Cardinals. He has already racked up several All-Star selections, multiple no-hitters and a Pitching Triple Crown, leading the league in ERA, wins, and strikeouts. When it comes to cards and collectibles, hard-throwing pitchers garner a lot of attention. His part in leading a resurgence in the Motor City has helped his signature maintain its value. It's also coveted by collectors who chase pitchers with no-hitters. As Verlander continues to rack up the accolades, the value of his signed items will continue to go up. 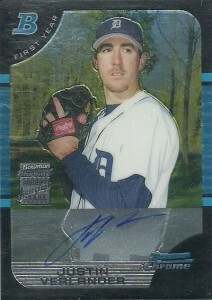 Verlander has over 40 rookie cards, including several autographs. All were released in 2005. He also has Upper Deck Team USA cards and autographs dating back to 2003. 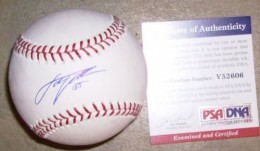 One of Velander's most limited rookie cards, it features an on-card autograph and is serial numbered to 99. A well designed card, laid out vertically, the card's gold foil accents and prominent picture make this a classic. Despite the lack of serial numbering or known print run, the Bowman Chrome brand has such a loyal following, that it has truly lived up to it's moniker as "Home of the Rookie Card." 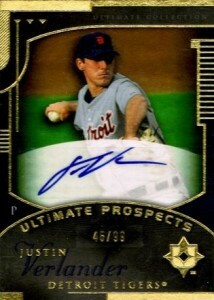 Featuring an on-card signature and chromium card stock, this is the quintessential Justin Verlander rookie card. 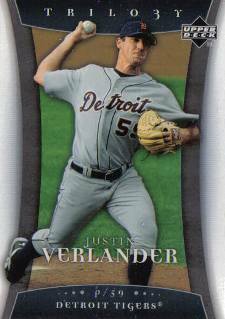 .2007 Topps Chrome #254 Justin Verlander. Black Refractor. NM-Mt. 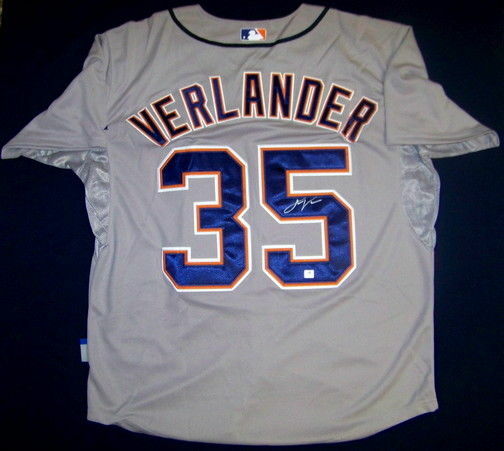 Below you will find an example of what Justin Verlander's authentic signature looks like. This can be used as a first point of reference for determining the legitimacy of autograph memorabilia, but is not a substitute for having your items authenticated by a well-respected professional autograph authentication company. Some of the trusted sources within the sports memorabilia market include the following companies: PSA, JSA, Steiner, and Tristar. Click on any of the images below to view full size photos. Signature is signed on a light upward angle. The signature is defined by the letter "J" which consists of an elongated lower loop. A long tail off the "J" is present and flows to the right across more than half of the signature. The letter "u" is visible. An over-sized "V" equal in size to the "J" is clearly visible. The last alpha character resembles the letter "d" but can also be described as a blend of an "oc." His jersey number "35" is often inscribed. 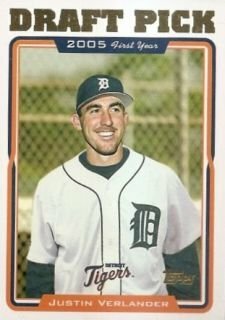 I have a few JV cards, and I need to see what they are and what they’re worth. Best pitcher in baseball in 2001 for sure.